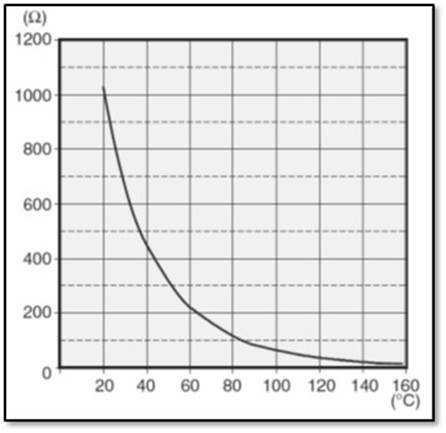 The attached curve is the performance curve for the Rotax sensor in the new heads. I am not an electrical guru and am not sure the above stated gauge is compatible with the Rotax sensor and will indicate the correct coolant operating temperature. Is there anyone out there that has the new cylinder heads, and if so, what type gauge are you using to indicate the coolant temperature in the cylinder head? Is the above gauge the correct gauge for this application? Thanks for your help. You shouldn't have any problem, but I will say it would be preferable that your gauge had a lower limit. Your lower limit of 120F will make it harder to see the lower scaled coolant temps. Thanks for your reply. Why do I need to be concerned about the lower CH coolant temperatures? The only difference in the scale readings between the two gauges on the lower side is 10 degrees C (40 to 50 degrees C). Also I note on the 310-911 gauge information that it is for use with a Stewart Warner sender. That statement is not on the 310-915 gauge information. Do you know what sensor (sender) Rotax uses in the new Cylinder heads? Would either gauge be compatible? You can stick with yours. I was just thinking a wider set of numbers on the gauge would open the numbers up some and not have the bottom number right at 120F. You're right about the 310-911 as it wouldn't match the VDO sender, but something along that line that would match would be just fine. Stick with what you have for a while and see how you like it. Don't you mean the 310-911 would not be compatible?